I struggle with innovative breakfast ideas for myself, let along my two girls. We get stuck in a breakfast rut and so I was happy to be asked to try out a couple of new products for weaning babies, suitable for use at breakfast time. Holly has been trying out these bright, clever pouches of Wakey Wakey breakfast cereal from Ella's Kitchen which are available in both plain flavours (so that you can add your own fruit or yoghurt if you fancy it) and fruity flavours. Holly started by trying the stage 1 Wakey Wakey Mango + Apple Baby Porridge which is made from rice maize and oats with tiny flakes of fruit. At first she REALLY enjoyed the change from smooth plain porridge but I think the novelty soon wore off - it is quite a big packet for a stage 1 weaning product given that stage 1 doesn't last very long. 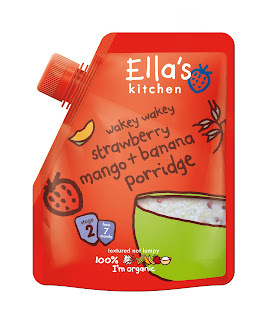 Next she moved on to the stage 2 textured Wakey Wakey Strawberry, Mango + Banana Porridge. It is noticeably thicker but not lumpy and it comes with visible flakes of strawberry in it. I think this one went down better with Holly. I really like the pouches - they come with a screw top which means you can keep the porridge fresh and pour it into a bowl easily without having to store a box in your cupboard which leaks flaky porridge dust everywhere! 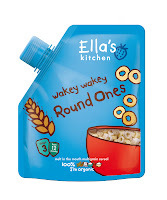 OK, so the pouch is plastic and that worries me, environment-wise but Ella's Kitchen at least make some efforts to encourage recycling of their food pouches. Normally however, I like to mix Holly's porridge with some fruit puree (sometimes homemade! sometimes not) or with a spoonful of yoghurt - it makes me feel like I'm in control of the flavour. On the day when I decided to first introduce Holly to yoghurt, Rachel's got in contact with me to tell me that their "My first yoghurts" selection packs had just been re-invented with a new improved recipe and four fruity flavours; the perfect accompaniment to Holly's breakfast porridge! Rachel's organic first yoghurts are suitable from 6 months onwards and come in strawberry, banana, raspberry and peach flavour. They are naturally sweetened with fruit juice so there is no added sugar and because they are made with whole mik, they are packed full of calcium. 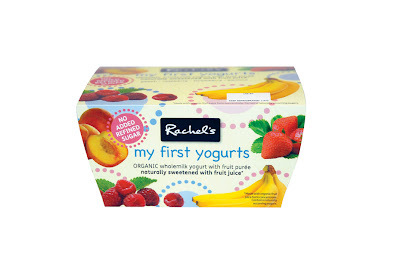 Rachel's My First Yoghurts claim to have the perfect texture for babies when weaning but I find the texture a bit alien; there is rice starch added which gives them a thick appearance and it makes the yoghurt appear ever so slightly grainy. Mind you, Holly loves them and I'm hoping that because they are a little sweeter than some children's yoghurts, Holly will enjoy them for longer than her big sister did (Lara mysteriously stopped eating yoghurt at about 8 months old and has refused to try it since).